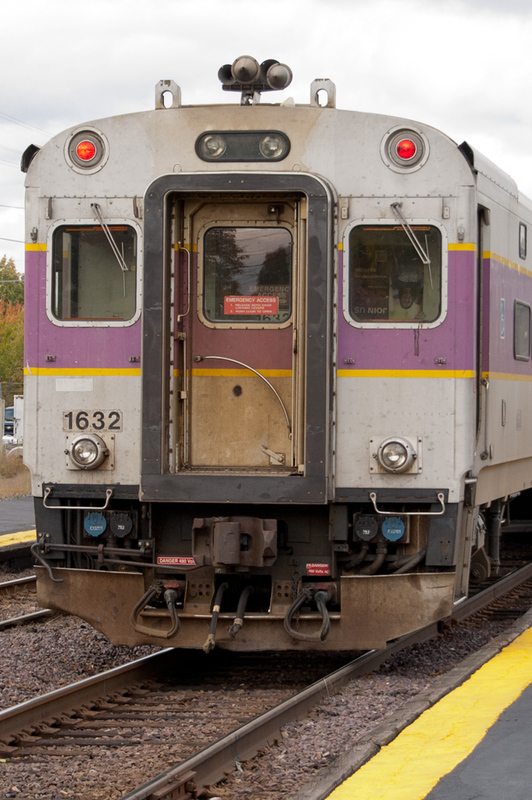 MBTA GP40MC No. 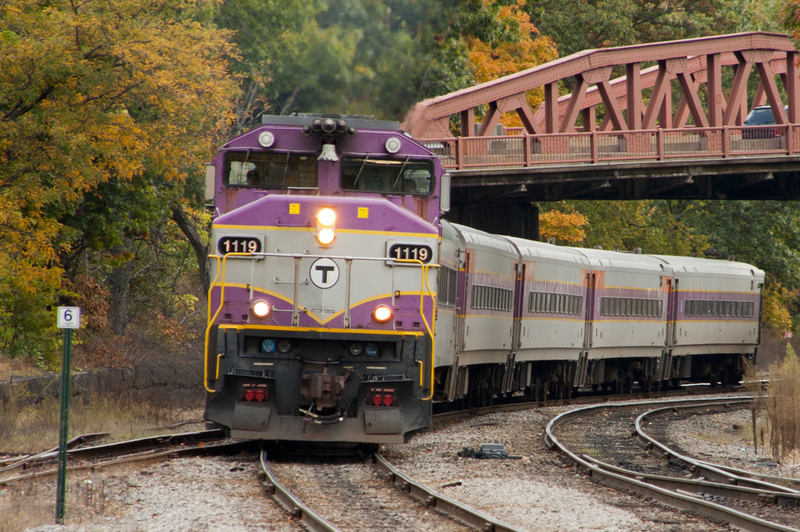 1119 leads a westbound into the station at Ayer, Ma on Oct. 8, 2012. I went to a wedding in Portland on the 7th and stopped here on the way back to see what there was to see. It’s been awhile since I’ve posted any trackside shots. I’ve been getting out though when I can. Here are a few from New England in 2012 and 2013 that I haven’t shared yet. Mass Central GP20 No. 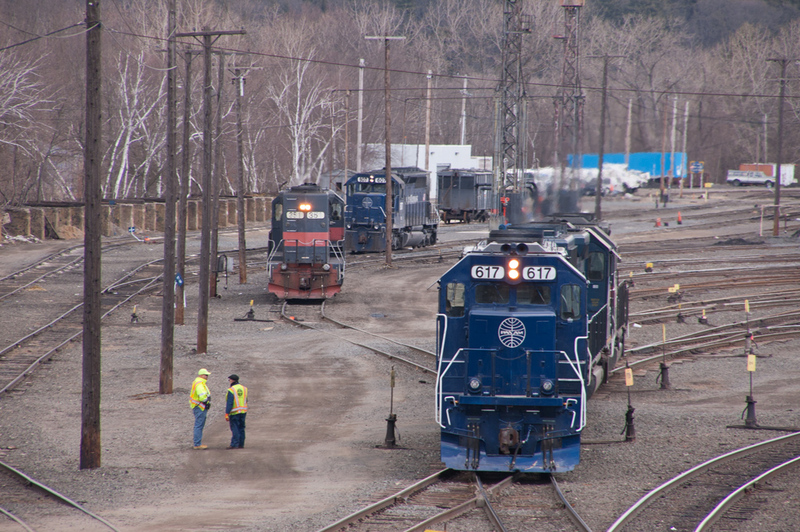 960 is sandwiched between a pair of Wisconsin Central boxcars as it works the CSX interchange yard at Palmer, MA on May 11, 2012. 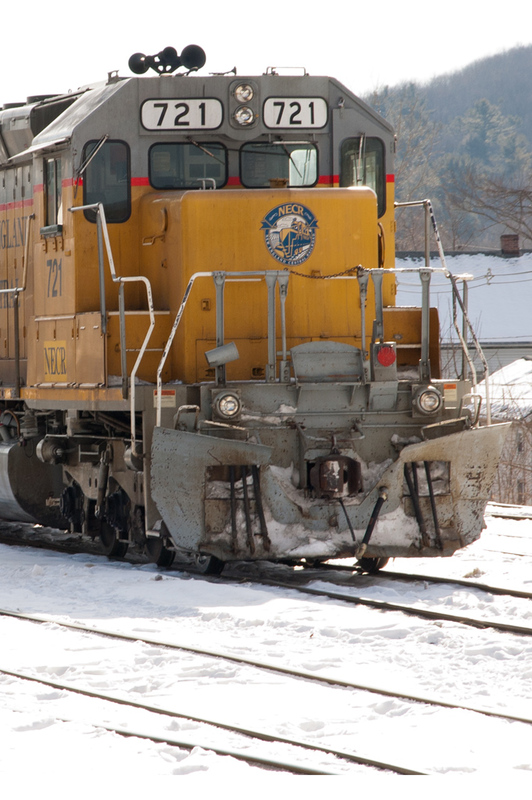 NS SD70 No. 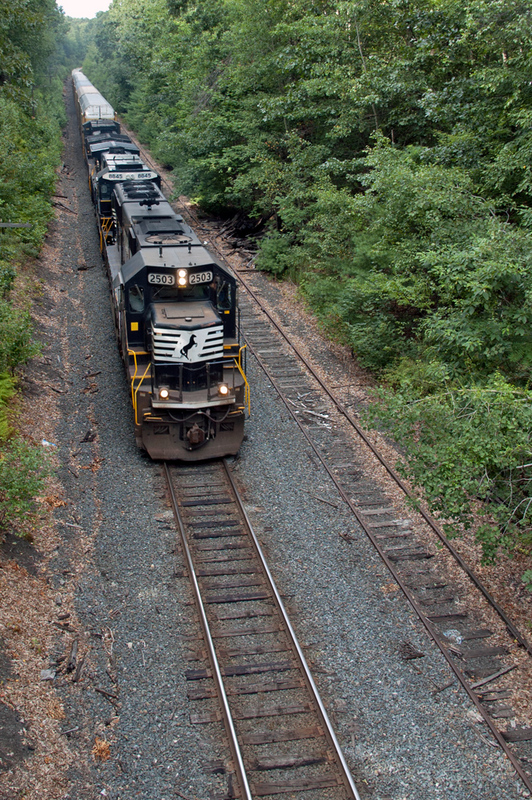 2503 leads AYMO as it passes under the bridge at Wisdom Way in Greenfield, MA on July 27, 2012. 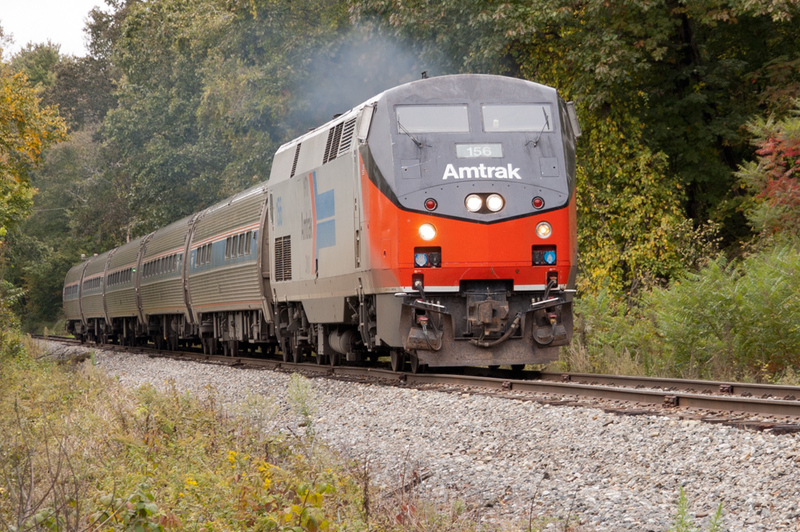 Amtrak P42DC No. 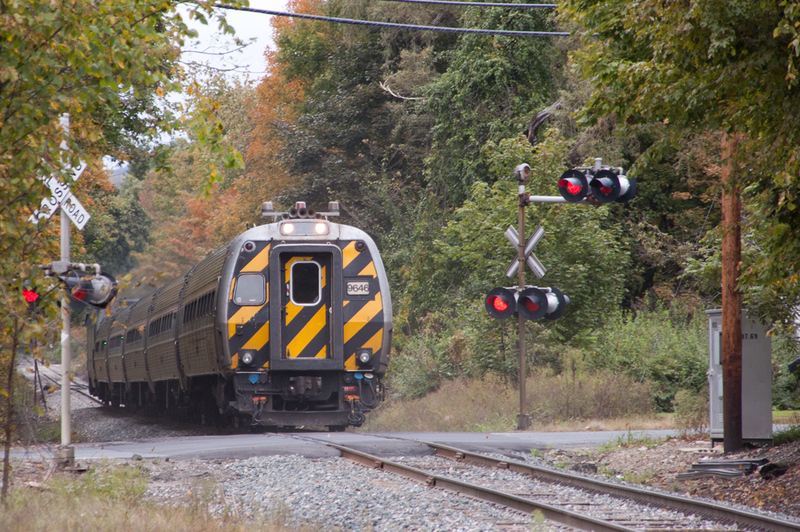 156 in it’s pointless arrow heritage scheme leads the Vermonter southbound through Northfield, MA on Sept. 29, 2012. Pan Am Railways GP40-2W No. 512 is the trailing unit on an interchange run to White River Junction. 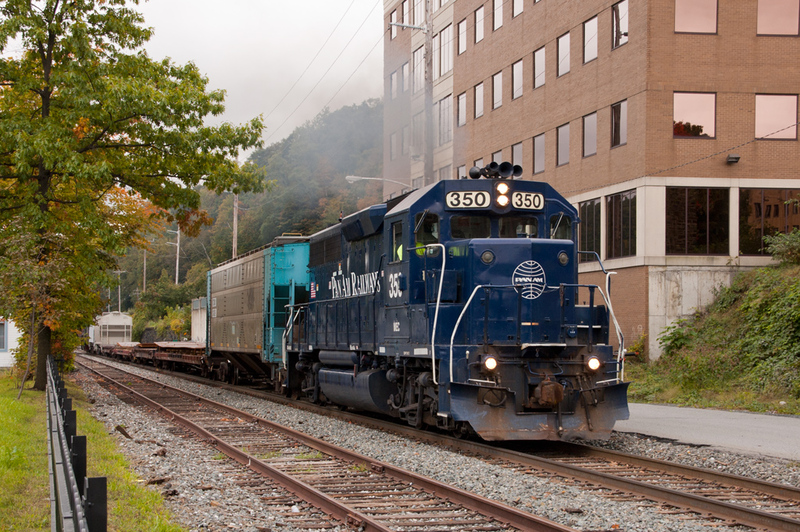 The train is on NECR just south of Brattleboro, VT on Sept. 29, 2012. NECR SD40-2 No. 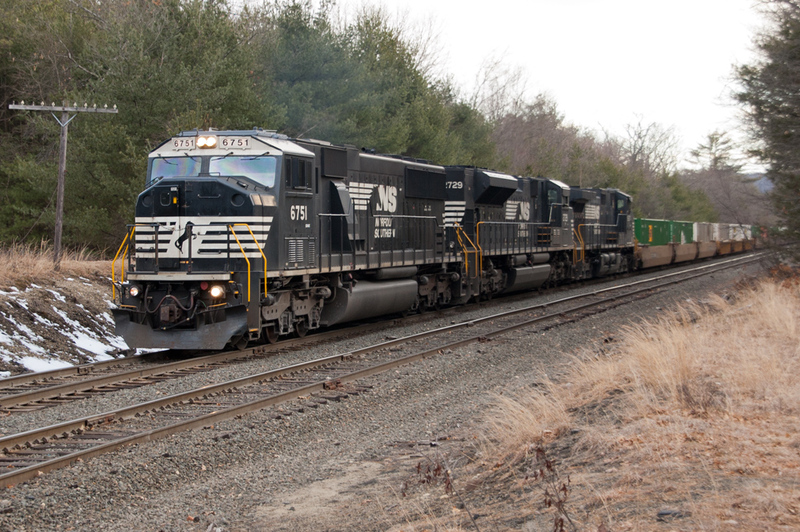 721 is at Palmer, MA on Jan. 5, 2013. This was the leader in a 3 unit consist of former Union Pacific SD’s. 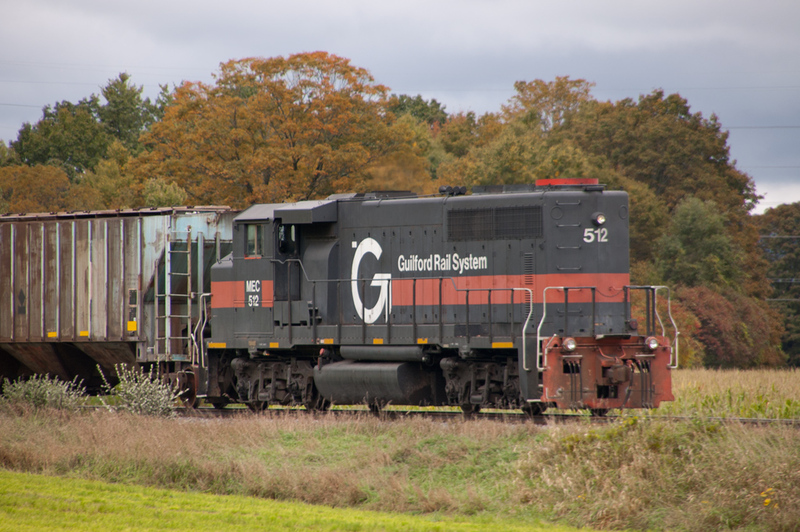 They look good, and, now that NECR is owned by G&W an not Rail America, perhaps they’ll stay that way, or even get repainted into black and orange! Pan Am SD40M-2 No. 617 (formerly a Trona SD45-2) shoves back onto the service tracks while other Pan Am power waits to be called to duty on a brisk Mar. 27, 2013. An hour or so later, after returning to the yard from an excursion to the north, we heard over the scanner that a rail under one of the locomotives back there had rolled over. Never did find out how they resolved that. 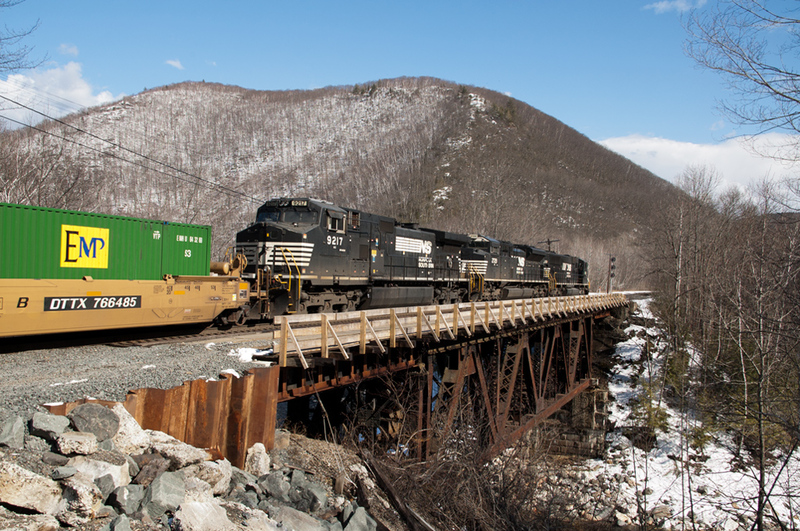 A trio of NS diesels leads MOAY out of the Hoosac Tunnel and across the Deerfield River on Mar. 27, 2013. Tom Murray and I have been here a lot, and just about every time an eastbound sneaks up on us. We nearly drove away and missed it. 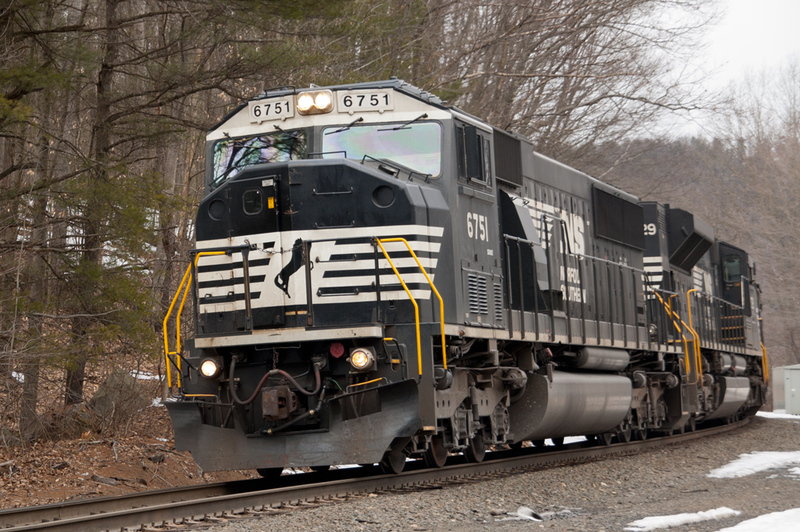 NS SD60i No. 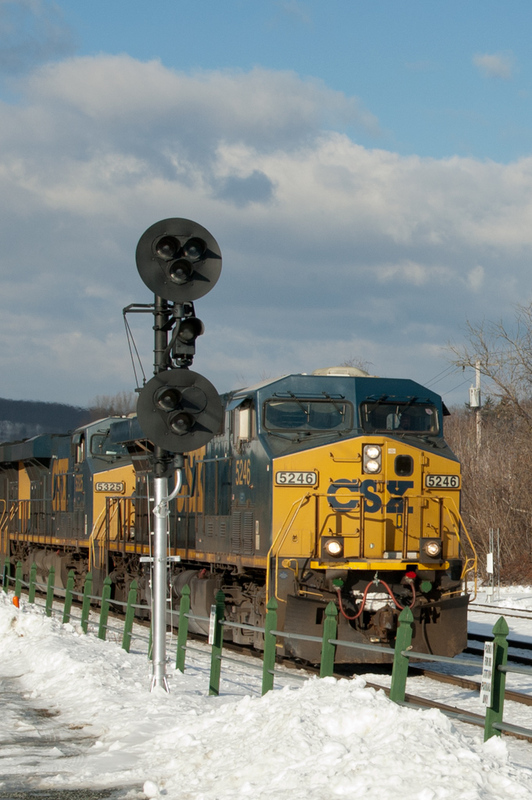 6751 leads MOAY through Shelburne Falls, MA on Mar. 27, 2013. It was traveling so slow that we turned around a couple of times, got coffee in Buckland, and still made it to our planned location just east of Shelburne Falls proper with plenty of time to set up. Having thought we had MOAY missed it going through E. Deerfield, we just barely made it to Lake Pleasant in Montague in time to catch it as it continued it’s crawl east. 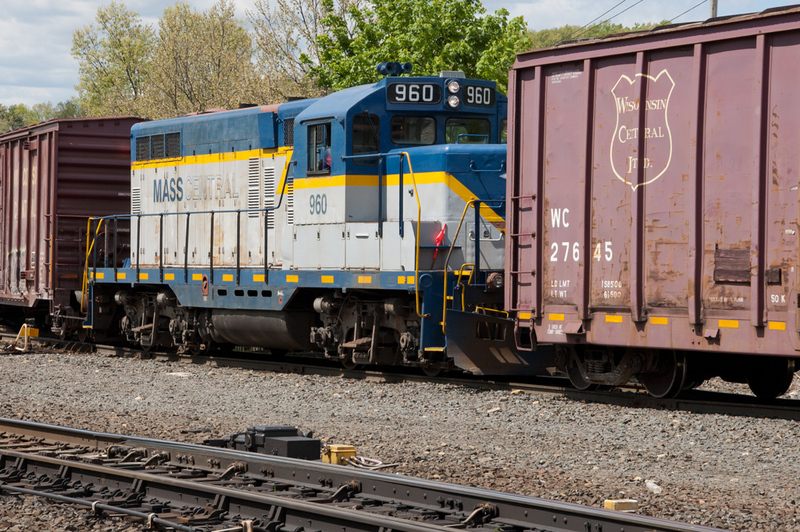 This entry was posted in Railfanning and tagged AMTK, Amtrak, Ayer, Brattleboro, East Deerfield, Lake Pleasant, MBTA, MCER, NECR, NS, Palmer, PAR by Milepost15. Bookmark the permalink. 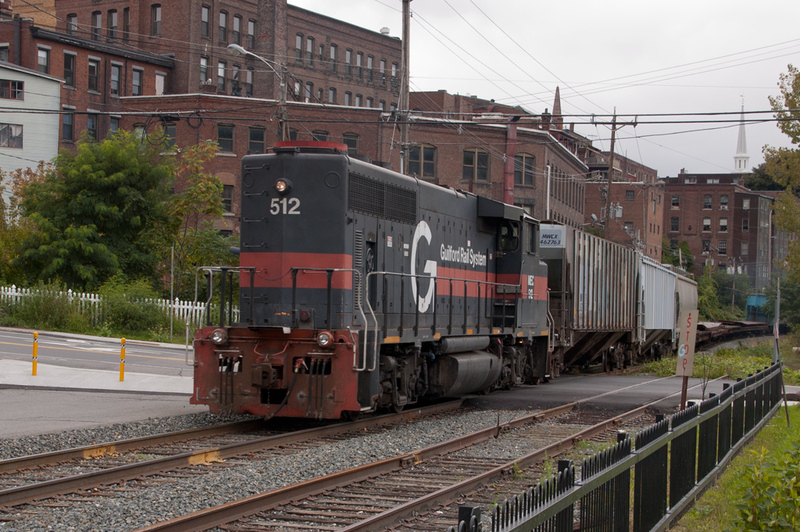 I enjoyed these action shots a great deal – your Brattleboro tag alerted me to your blog’s presence. Thanks for sharing your sightings! I’m a Bratt resident with a mixed topic iphone photography WordPress blog (the unifying theme is that all the content is basically of a local, everyday nature), whether the natural world, abstract ‘”urban”, or found moments. I do have a definite niche focus on local railroad history, a subject of great personal interest – a series dubbed ‘Depot Discoveries’. You might like to check it out! Thanks, I’ve been looking through your blog, your photography is really impressive and you’ve found some locations that I’ve never visited before. I’ll have to check them out next time I’m up that way. Thanks a bunch Chris! Glad you enjoyed it – all with an iphone, too, my personal small challenge. I am having a ball digging up local railroad stories, so there’ll be more episodes soon. Let me know if you want a local guide on a trip up this way sometime. You can help me out with the state-of-the-art and modern rails, too. 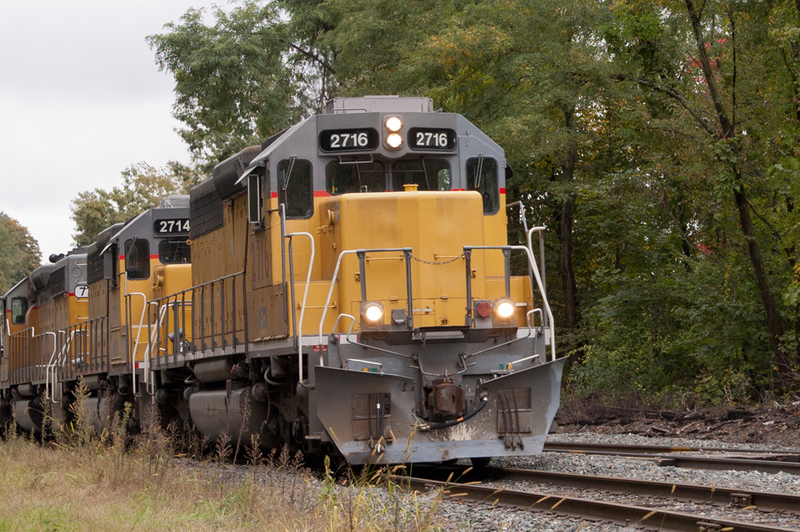 I’m a little rusty – caught train fever when I was a teen and then life happened. Glad to be back into it!